The Little Things are Back! Jeff & Barbara with The Little Things in Edinburgh, Scotland! They were a huge hit when they performed at our place in April, 2018. If you were in attendance you’ll remember how many folks immediately asked them to please return, & also asked US to make sure they DO return! 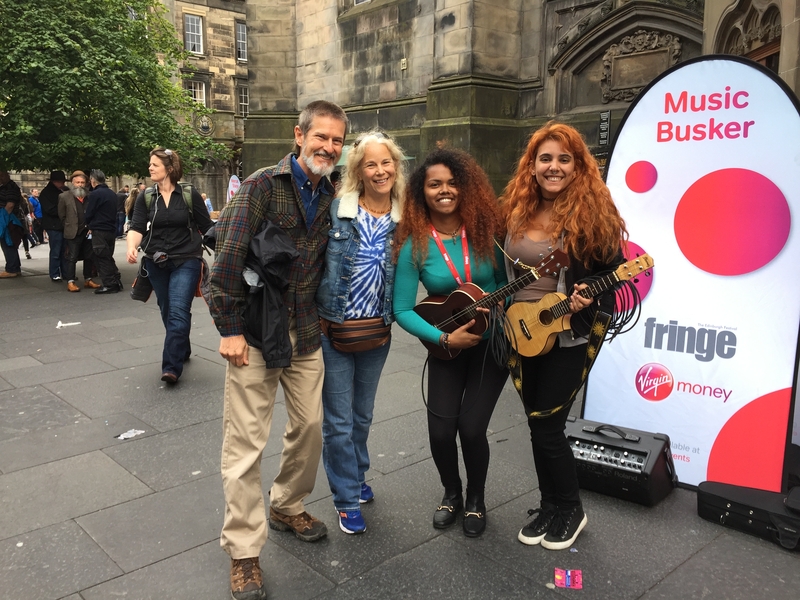 We (Barbara & Jeff) first met these talented young ladies in Edinburgh, Scotland, in August, 2017, they were street performing on The Royal Mile during The Fringe Festival. We enjoyed their uplifting music, sincere talent, smart lyrics, gorgeous & effortless vocal harmonies, & ukulele strumming. Their youthfulness was refreshing, their grounded joy contagious. A confident melody line supported by scintillating harmonies is the rock-solid core of The Little Things music, but their particular dash of wit is what separates them from other ukulele duos. 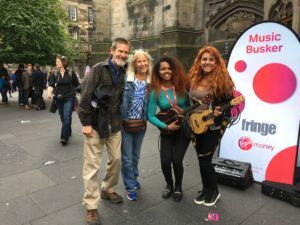 Katy Channing & Shanece Gransam developed their chops busking in New Orleans with a smart twist on recognized covers, & now their clever originals are getting noticed worldwide. Fully supporting themselves with constant touring, they transform just two ukuleles & voices with a tight looping station technique, generating a lush mix of indie/folk & pop that has been selling out audiences across the globe. Cost: $15 in advance; $20 the day of. Call: 941-966-5800 FMI or to reserve your seat, space is limited.